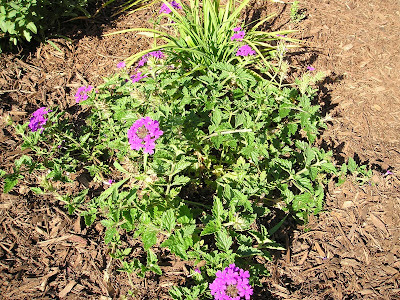 Growing The Home Garden: What's Not to Like About 'Homestead Purple' Verbena? What's Not to Like About 'Homestead Purple' Verbena? What's not to like about 'Homestead Purple' Verbena? The only answer I could come up with to my own question is that I don't have enough of it! It is a fantastic flowering ground cover. 'Purple Homestead' grows very well with little care in full sun. For Tennessee gardens it's a must have. 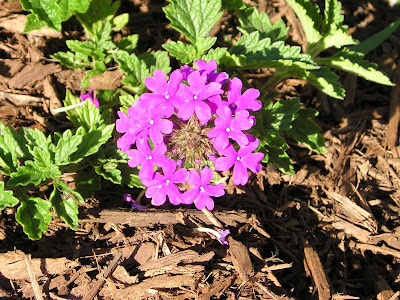 Who Discovered 'Purple Homestead' Verbena? Do you know Allan Armitage (Armitage's Native Plants for North American Gardens ) and Mike Dirr (Viburnums: Flowering Shrubs for Every Season )? You've probably heard their names before. These two University of Georgia professors, horticulturalists, and authors are responsible for the discovery of 'Purple Homestead' verbena. According to an article by retired Arkansas Extension Agent Gerald Klingamen, the two Georgia professors were driving to Athens when they spotted a large mass of Verbena on a homestead (hmm, could that be where the name came from?). They stopped to inquire about the plant but the lady who owned the property didn't know much about it. She allowed Armitage and Dirr to collect some cuttings and now it's in garden centers and nurseries everywhere. It's hard to beat these purple blooms that flower prolifically throughout the summer. We have three of these plants with two more coming from cuttings. One of the 'Purple Homestead' verbenas was in our mailbox garden and mysteriously died. I suspect it may have had too much moisture. It really looked fantastic this spring mixed with 'May Night' salvias and an Achillea (yarrow). I had just bought two more small plants for other locations when it passed away. The verbena in the first picture was a cutting from our first one that I rooted last summer so technically we still have the first plant since this one is a clone. It's growing thick and strong in our front porch garden. This verbena bloom is forming a near perfect circle with its flowers. They root very easily from cuttings or you could divide them each year if you want more, who wouldn't? I wish I could take a photo of the verbena flowers when they are bathed in the moonlight. I doubt my camera would get a great shot but they seem to glow an effervescent purple when reflecting the moonlight. It would be a perfect ground cover flower for a night garden. Can you figure out what's not to like about 'Purple Homestead' verbena? I sure couldn't! 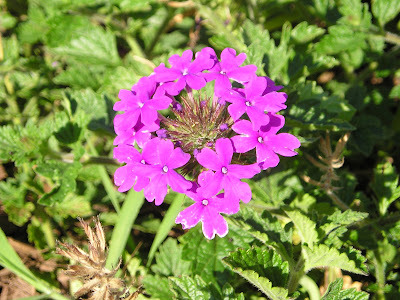 Want to know more about 'Purple Homestead' Verbena? 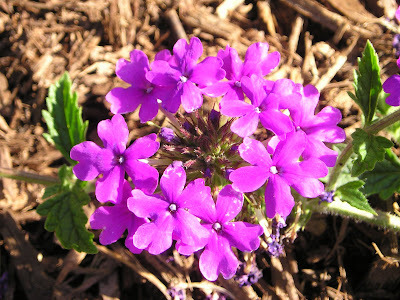 Here's some information on propagating 'Purple Homestead' Verbena.